On the last day of my recent stay in New Orleans, I had an amazing bowl of shrimp and grits. It was so good that it left me wanting more, and when I got home I tried to find a recipe that was similar. Unfortunately, a lot of the recipes were backed with calories and no one recipe had all of the components of the dish I had in NOLA. So, what's a girl to do? I Macgyvered my own recipe of course, by combining several different recipes and then looking for ways that I could slim the dish down. In the end, these New Orleans style shrimp and grits turned out even better than the ones I had on my trip, and had lower calories to boot, although it still won't be making any Weight Watcher's lists. Step 1: Prepare the Grits. In a pot, bring water, chicken stock and butter to a boil over medium high heat. Whisk in the grits a little at a time and cook for 5 minutes, whisking and stirring often. The mixture will start to look dry, but just keep stirring. Add in the cheese and half-and-half and continue whisking for another 2 minutes. Cover and set aside. Step 2: Prepare the shrimp. Combine Paprika, Cajun Seasoning, Basil, Oregano and Pepper in a large bowl. Add the shrimp to the bowl of seasonings and coat thoroughly. In a large saute pan, melt two tbsp. of butter and 1 tbsp. garlic. Cook for 30 seconds and then add the coated shrimp. Cook the shrimp until they are tender. Be sure no too overcook them, or they will be tough. Cover and set them aside, but do not clean out the saute pan. Step 3: Prepare the sauce. In the saute pan, add 3 tbsp. of un-bleached flour to the drippings from the shrimp. Mix it well to make a roux and continue to stir and cook over medium heat for 10 minutes. Don't worry, the roux will not burn as long as you keep it moving often. Add the chicken stock and half-and-half and whisk together well for two minutes, then add the Worcestershire and hot sauce. Set aside and let cool a little. Step 4: Chop up one Andouille sausage into small pieces and cook it in a small saute pan over medium high heat until done. I use pre-cooked Andouille so it only takes a minute or two to warm it up. Step 5: Putting it all together. Add a spoonful of cheese grits to the bottom of a shallow bowl. Top with 5 shrimp and add plenty of sauce. Top with a few pieces of Andouille sausage. Kathleen is a homeschooling mom of four boys with a serious case of the Wanderlust bug. Her love of travel extends to her children, and has resulted in the family visiting 48 states to date, and traveling nearly a third of the year. She is the owner of LifeWith4Boys.com where you will find information on Family Travel, recipes, reviews, lifestyle and more. This looks SO good. I will have to pin this to make for later! This looks like something my fiance' would love! I'm not a seafood person, but my boyfriend would LOVE this sooooo much! My mom would love this! Shrimp and grits is one of my faaaavorite meals. Would you believe that I've never had grits? Yeah, I know, totally sheltered. I do love shrimp though so I'd be interested in trying a recipe like this, especially if you liked it so much! This seems like an odd combination to me but apparently it's all the rage in the south because my dad raves about shrimp and grits. Definitely not a seafood person but this looks absolutely delicious. I am tempted to try it because it looks that good. I have heard so much about shrimp and grits, but have never tried them here on the West coast. I think I'll ask my husband to make these soon! I've never had shrimp and grits (together) but it sounds so tasty. This looks great. I've never actually made grits, although I have some in the cupboard...and I have shrimp... hmmm. I love the shrimp part, but I'm one of those people that has an issue with the texture of grits. I always wanted to try shrimp and grits but so scared to make it in case I don't do it justice! Looks so good! Oh man that looks so good! I wish I weren't allergic to shrimp. Oh man Jenn, I don't know what I would do if I was allergic to shrimp, I love them! 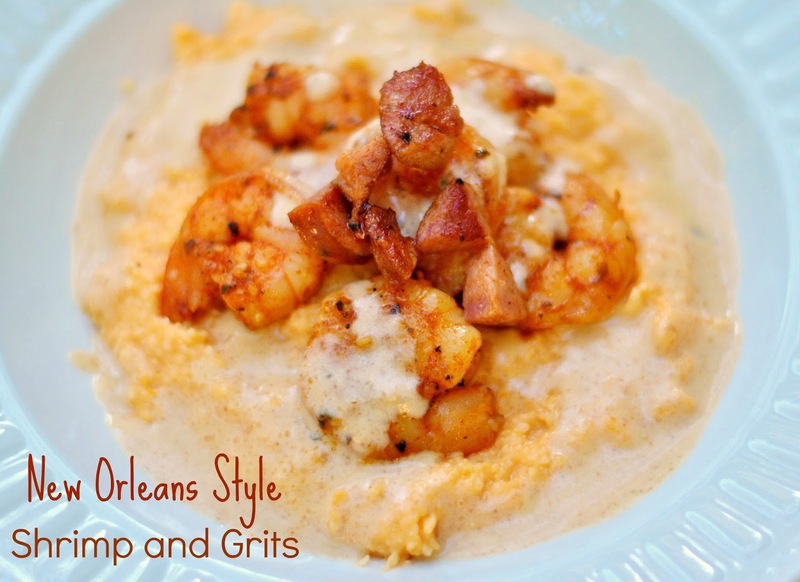 I have NEVER had Shrimp and Grits before .... but this makes me want to try! That looks AMAZING. I love grits and shrimp so I am really surprised i have not had them together before. I totally just printed the recipe :) Totally making this soon! Your shrimp and grits looks yummy. just tried this recipe out tonight. It was delicious but Way too spicy for my taste and I'm born and raised in New Orleans. the only thing I will change next time is less spicy seasoning. me and the hubby enjoyed it though! Hmm. Different cajun seasonings can definitely pack a different punch. Definitely just try it with less cajun seasoning on the shrimp next time. Ours wasn't very spicy at all, the boys were all able to eat it, and I am not a fan of very spicy food at all.